Our Diamond Plate Custom Playing Cards feature a unique background for presenting your logo or design and make a great promotional item for your casino or poker event. 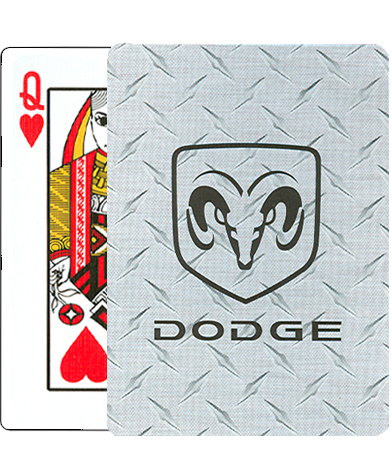 These custom-imprinted playing cards are Poker-size (2-1/2" x 3-1/2") with Regular Index (i.e. standard size numbers and pips) faces, and come packaged in sturdy cardboard cellophane-window tuck boxes that showcase your custom design. Diamond Plate: Poker Size – 1 Color Imprint $4.05 $3.95 1-3/4" 2-9/16"
Diamond Plate: Poker Size – 2 Color Imprint $5.45 $5.35 1-5/16" 2-5/16"
It's easy to get started with your Diamond Plate Custom Playing Cards. Simply email your artwork in digital file format to graphics@kardwell.com. Then call 1-800-233-0828 to speak with a representative.